Brick Town Talk: Geometric Gem - LEGO Town, Architecture, Building Tips, Inspiration Ideas, and more! Utrecht, The Netherlands - (BTT) We seem to be on a bit of a modernist kick at the moment, and for good reason - not everything needs moldings to be a masterpiece. The Schröder House, designed by Dutch architect Gerrit Thomas Rietveld and completed in 1924, proves this to be true. Quite possibly the best architectural expression of Neoplasticism (De Stijl to the locals) ever created, the Schröder House is made up of a series of intersecting planes with key elements highlighted in primary colors. Inside the building is almost completely open with a virtually wall-free interior - quite radical at the time, when the concept of loft apartments were still decades away from being trendy. 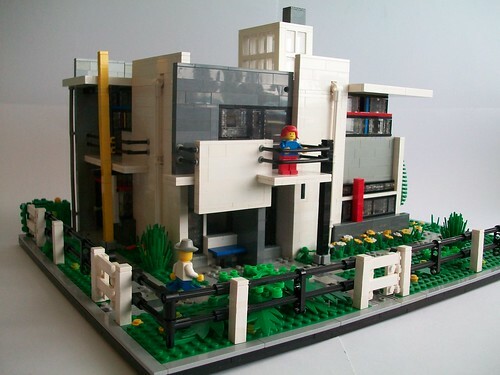 If only we could make the blueprint in Legos and then start building our house to those plans! Wouldn't that make it easy? I think it's good that you're on a "modernistic kick" right now. A lot of people are! We're definitely going to incorporate a lot of modern designs for our house.